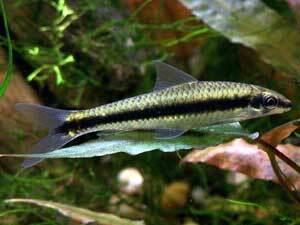 How to identify the Siames Algae Eater. Recently I had the luck of running across 6 beautiful little Siamese Algae Eaters, mistakenly labeled at the Pet Store as Flying Foxes. Knowing their true identity I immediately bought all 6, and now that they've settled and I've gotten some good pictures, I'd like to share with you all some tips on identifying this amazing little fish. First off let me say that I've searched the Internet extensively for info on SAE's, and I have to admit I am amazed at the conflicting information concerning this innocent little fish. As with everything on the Internet, easily half the information posted is either inaccurate or outdated, so it is very possible that something I post is also incorrect. So this is sort of my disclaimer: to the best of my knowledge, what I'm writing is as accurate as information as I can find. Ok, I'm sure you can see the differences right off the bat between a Siamese and Chinese Algae Eater, so I'm not going to get into that much. 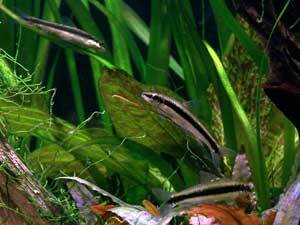 But as you can see, the False Siamensis and Flying Fox are very similar in apperance to a true Siamese Algae Eater. The easiest and most apparent difference is the horizontal black stripe running down the body. Both the False Siamensis and Flying Fox have a nice smooth black stripe topped with a gold stripe. The true Siamese ALgae Eater has a ragged, almost zig-zag black stripe running to it's tail, and no gold stripe. The next thing to look at is the mouth. Admittedly it's hard to see in the photos, but on close inspection you'll notice that the False Siamensis and Flying Fox both have twin pairs of barbells (the little whisker by their mouths), but a true siamese Algae Eater only has 1 pair. Now observe the color of the fish itself. You'll see that both the False Siamensis and Flying Fox are more colorful, with some yellow or red markings to the fins. 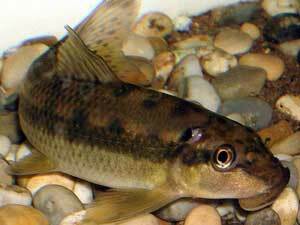 The Siamese Algae Eater is rather blandish gold-brown-silver. But a distinctive marking is along the back, where the black outlines the scales, making the top of the fish appear retulicar. Another big difference is in behaviour. Both the False Siamensis and Flying Fox are solitary, and may become aggressive to others of its kind. 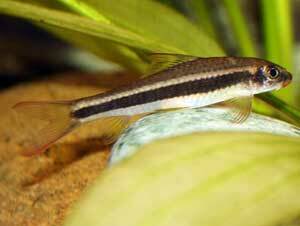 The Siamese Algae Eater, on the other hand, is a peaceful schoaler, and does better in a small group of 4-6. Finally, one last thing I've read about and also observed in my tank concerns the peculiar way a Siamese Algae Eater rests. It doesn't lie flat on it's belly but keeps propped up slightly with its tail, pelvic and pectoral fins; prefering low, dense plants like Cryptocorynes. I observed mine doing this very thing the other evening, so it seems only appropriate to end this article with a picture of 3 of my Siamese Algae Eaters resting in the dim evening lights.